330 pages | 13 B/W Illus. This groundbreaking book both explains and expands the growing debate on ecological (environmental) social work at the global level. In order to achieve this, the book strengthens the environmental paradigm in social work and social policy by undertaking further research on theoretical and conceptual clarification as well as distinct reflections on its practical directions. 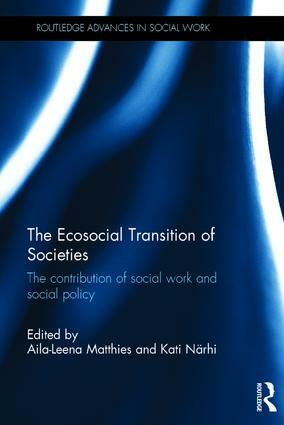 Divided into five parts: concepts; the impact of environmental crises; sustainable communities and lifestyles; food politics; and the profession in transition, this work’s main objective is to place ecological social work as a part of the more comprehensive and interdisciplinary eco-social transition of societies towards sustainability, balancing economic and social development with the limited resources of the natural environment. By focussing on these five core concepts, it shows how social work and social policy contribute to this transition through having a research-based approach and orientation on solutions rather than problem analysis. The book will be of interest to scholars from a broad range of disciplines, including those in social work and social policy, sustainability, economics, agriculture and environmental studies. This book addresses the most important issues for social work as a profession in transition during a time of vast environmental challenges. Chapters range from policy and conceptualisation through to practice that focuses on sustainability, activism and food politics. This is the new face of social work, and it’s wonderful to see a contribution that incorporates contributions from so many parts of the globe. - Adjunct Professor Jennifer McKinnon, Charles Sturt University, Australia. Aila-Leena Matthies is Professor of Social Work at the University of Jyväskylä, Kokkola University Consortium. She has been publishing about the ecosocial perspective of social work in Finnish, German and English since the late 1980s. Kati Närhi is Professor of Social Work in the Department of Social Sciences and Philosophy, University of Jyväskylä, Finland. Her main research interests are ecosocial approach in social work, ecosocial transition, community social work, structural social work, participation and user involvement.